Wish I had more business cards to sort. I would really like to subscribe to your blog and add it to my Google Reader, but can't find the button anywhere. Do you not have it enabled? I really enjoyed looking through your blog. If you scroll all the way down to the bottom of the home page, keep your eye out on the left for 'Subscribe to: Posts (Atom)' and give that a click. Thanks for your interest, glad you enjoyed the site. Coupons or receipts possibly. 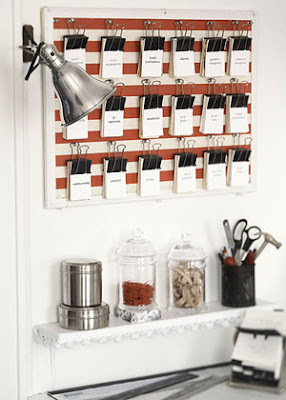 It would not be as pretty but still organized and look much neater than the piles laying around my house. fabric swatches for a quilter. paper swatches for scrapper/paper crafter.